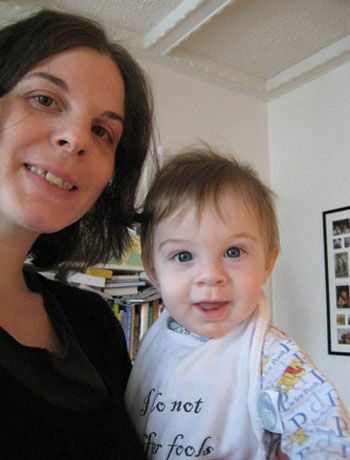 My early blog posts were all about my struggle to eat well and feel well as an expecting mom. As a mom, I still struggle with those things. I spend so much of each day working to feed Leo well and making sure that he feels good that looking after myself becomes the item at the end of every to-do list—the one that just gets transferred to the next day's list. I realize this is what almost all the moms I've ever encountered are up against. How do you take care of yourself when you're sleep-deprived and you never get a minute to relax, never mind an hour to work out? I can think of a few responses to this conundrum. There's acceptance: I've got a young child and a spare tire; big deal. Luckily I'm a food writer, not a swimsuit model. And there are baby steps to take. Maybe if I eat a bowl of yogurt with fruit next time I crave something indulgent, and I walk briskly with the stroller next time I get the chance, those healthier habits will gradually gain momentum. I know, you're waiting for the direct route. Like: go to the gym 4 mornings a week and cut out sugar. I'm sure there are people who can make a major lifestyle change, even when they're tired and they're home with a baby. But I'm not sure I'm one of them, and I'm not interested in dedicating my fleeting snippets of free time to guilt and failure. So it looks like I'll be taking the long way. Here's what I'm thinking. I love to eat and I love to cook, so eating well is not as hard for me as it is for some new parents. In fact, I love to grocery shop too. Hey, I'm in pretty good shape here. I can focus on enjoying good, healthy food, rather than denying myself the indulgent, unhealthy stuff. And even though I've got my anxieties (work, money, naps, keeping the house in order....) I feel privileged to have the flexibility to be home with Leo right now. It truly feels like an honor to be around this wonderful little boy, and to shape his days. I can be the mom I want to be by focusing on enjoying him, and prioritizing being cheerful and at peace with my life right now. My theory is that that success should energize me to make the right choices about diet and exercise whenever I have the chance. Because, as I knew back when I began this blog last January, taking care of my baby and taking care of myself are the same thing. I would never deprive Leo of a good meal or the sleep he needs, and when I'm overly hungry or tired, I am not the cheerful, generous, energetic mom he deserves. Sure, there are personal trainers, nannies and nutritionists out there if you can afford them. But right now, I don't need them. I don't feel like I'm living a picture perfect existence, but these days, I can really appreciate how much better life is when it isn't overshadowed by unattainable images of perfection. And then there's Leo. Proof that perfection exists, and is attainable. The kid can wake up with bedhead, a rash on his chin and a leaking diaper, and there it is: perfection. Because he has no idea that he should be any other way, and even as I try to tame his cowlick, lotion his face and change his diaper, I know that everything is exactly the way it should be.